What I think is new and noteworthy, you might find 'so five minutes ago'. This needs to be meme'd. Don't be mean. On Lifehacker today, I learned about a new blogging service called Tumblr (what is it with dropping that e before the r?). It's kind of a blog-lite kind of service--the analogy being that a if a weblog is a journal, a tumblelog is a scrapbook. I thought I'd start one cuz it looks so cute, and I'm intrigued by it's simplicity. 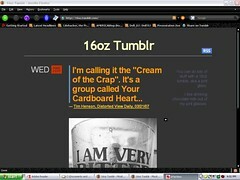 With the Share on Tumblr bookmarklet, you can grab and post anything off the web--quotes, photos, videos. If you're familiar with VOX, it works similarly, only more openly. Speaking of new stuff on the side-bar, you'll notice a couple new graphic-thingies. These link-button-things are for a an online movement aimed at harnessing the power of the interwebs to stick it to the Man (again). It's called Bum Rush the Charts, organized by a few prominent podcasters, and is an effort to show the music industry the power and reach of bloggers/podcasters. By coordinating an online sort of flash-mob, BRtC aims to rocket a single, independent band's song to the top of the iTunes charts, hopefully getting some executives' attention. There are some other things going on with this movement, not the least of which is the donation of 45 cents of each 99 cent purchase to a college scholarship fund (5 cents coming directly from sale, and 40 cents being donated by the band, in this case Black Lab, itself). Check it out. Be a part of a mob! And if you don't like crowds, this is all the better, being online, and such. Ok, it's been over a month. What the hell? Can't write much at the moment--I've got a little boy wondering why I'm not a-bed yet. I just wanted to point out the new section I've added to my side-bar. Yup. Audiobooks presented in podcast format. And no, you do NOT need an iPod to listen to a podcast. You can listen to these .mp3 files on anything that'll play .mp3 files--an mp3-player, an .mp3 compatible CD-player, or right off you computer. There are some family-friendly titles that might make for some fun, candle-lit, story-times. One of the cool things about these podiobooks is that when you subscribe to them, you can decide on the frequency at which you receive episodes/chapters. So, if it's something you wanna listen to on your daily drive to work/school/wherever, you can set it to release an episode a day; or if you want to make it more of an event, you can make it weekly or even monthly! Anyhow, I gotta get to bed, so if you wanna know more about this nonsense, or if you wanna know about what I'm listening to, lemme know.